Gayle Crosmaz-Brown (Wisdom Drums International) has applied for Professional Membership in The Holistic Chamber of Commerce. We like to get references for our members in order to strengthen our position in representing professionals committed to excellence. *** Colleague - I met Gayle at a Sacred Fire Ceremony at Northeastern Illinois University, in Chicago. She drove from Canada to Chicago to attend. Angaangaq, "Uncle" from Greenland came to our school to conduct the ceremony. She works with Uncle and is one of his trusted practitioners. 2. Does this professional/practitioner have integrity? *** Yes in the year we have worked together she has ALWAYS followed through on the work she says she will do. That to me is priority #1. Is their work safe and honest and do they follow through on their commitments? *** YES...she works within the framework of her skills and is ALWAYS honest in her approach of what she does. If you look at the drums she makes you will understand the level of work and commitment she has in that aspect of her work. Her drums are works of art.....amazing art. 3. On a scale of 1-10 (with 10 the highest), what would you rate the quality of their work? *** Her drums are a 10+. They are are amazing instruments for peace and healing for the people who receive them. *** Her work to help people with ceremony and prayer is of the highest quality too. I have been involved with her over the last year on several projects and ceremonies to help people. 4. Would you recommend them to a friend? *** I already have to MANY of my colleagues, and friends since I first met her. She has ALWAYS followed through. 5. Recognizing that you’re probably not an attorney, to the best of your knowledge, does this business comply with all appropriate laws and regulations? *** As far as i know. She is in Canada and I am in the United States, but I have only heard positive things. ***"I met Gayle about two year ago through Angaangaq "Uncle" from Greenland. The development of our professional and personal relationship in that time has developed over the respect I have for her, her work, her integrity, and the gentle way she touches the world through her efforts." I was making a World Tour in 2015, filming healers and their experiences in connecting to God, their higher spirit, whatever energy they tapped in to when they were doing their healing work. 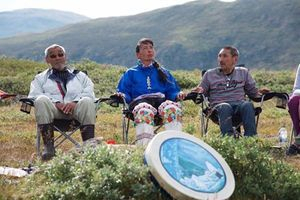 I ended up in Greenland with Shaman and teacher Angaangaq Angakkorsuaq. Like meeting an ancient sister, I was drawn to speak with Gayle. I had never met her in this lifetime, but as we spoke it became clear that we would meet again. 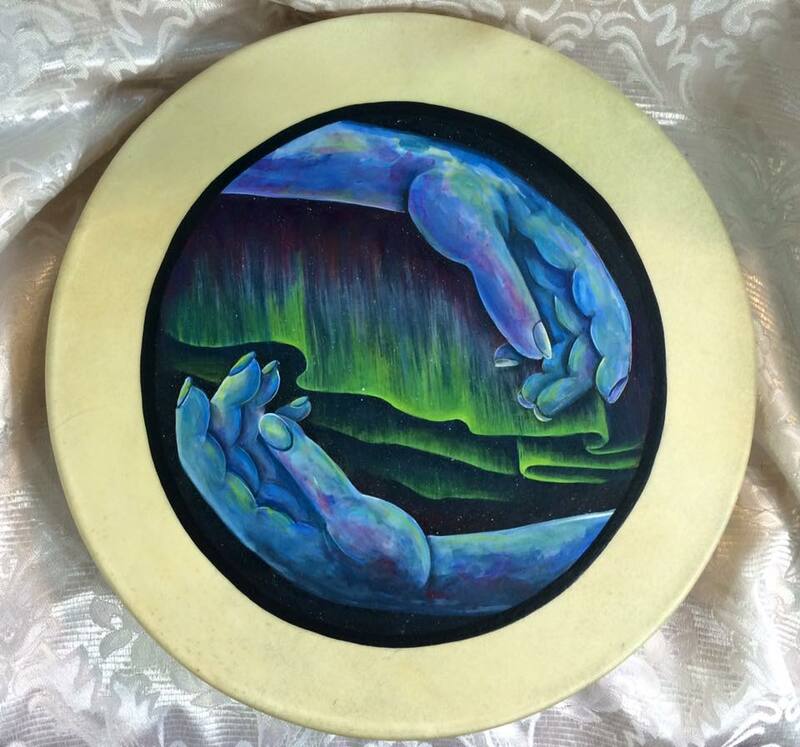 At one point during the week there, she presented Angaangaq with a sacred drum that she had created for his healing center. As both she and he explained the significance of this drum and how it connected with the ancients, I was intrigued. The sounds and images stayed with me. Fast forward a few months, I contacted Gayle to ask about creating a drum for my world travels. It was absolutely uncanny how she tuned in to my spirit, my purpose, my BEING. She did not know much about me, but every time she had a vision she wrote to me...first off, she said that it must be an OWL drum (my name SOVA means owl in several languages around the world!). She included the four directions. Then put a turtle in the center of it...my sea kayak was named Tortuga (means Turtle) years earlier. She added feathers - which are the SAME feathers that had come to me the previous year and used in a wand/fan I made. 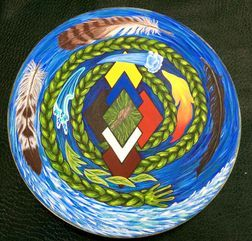 At every turn during the creation of my sacred drum, I was astounded. I decided to make a visit to Gayle in Canada as my world tour moved towards the north again. 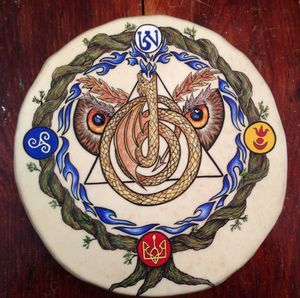 We held a birthing ceremony for this drum that has since become a part of me. Gayle taught me how to play it, how to sing into it, how to let the sound carry me into places I had never been. From someone who enjoyed the sounds of drumming but never participating to becoming a co-creator of the sounds and energy, I have never looked back. The drum continues in both my outer journeys and my inner journeys. It truly was created for ME. I love you Gayle and am ever grateful for the spirit that connected us! 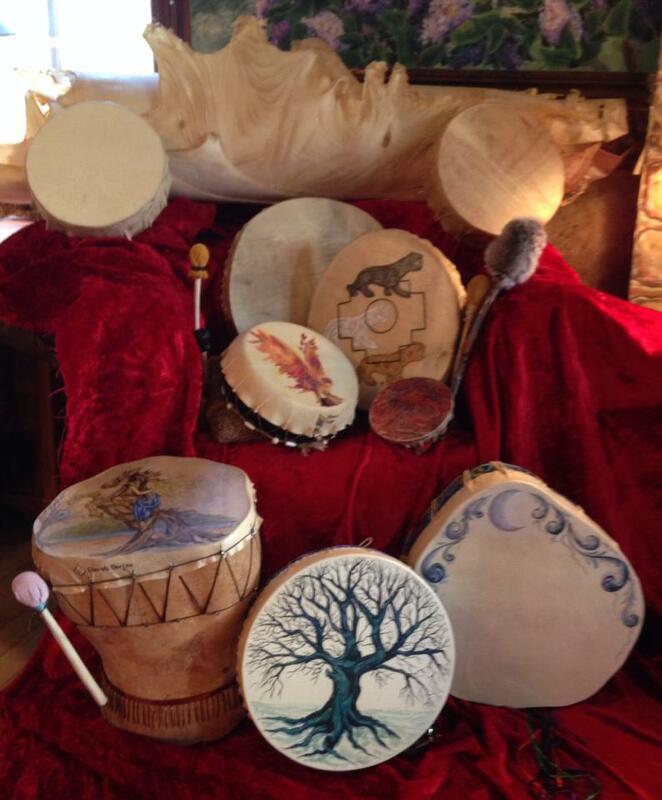 Universal Peace Drum: It all started just a month ago, when a friend invited me to attend Gayle's drumming workshop. Having been 'on the path' for some 30 years, I was sure I knew pretty well what I was about and what worked for me... That is until Gayle started playing her various drums, and then passed them on to us so we could try for ourselves... It was like being struck by lightning out of a clear blue sky! I had never touched a hand drum before, had no clue what to do with it; still, playing her Tree of Life Drum for a few minutes felt so right, so empowering that, when the workshop ended, I grabbed her by the hand, and this came out: "I want you to make me a drum, a drum to wake up humanity!!" I didn't say "right now" but it was implied... And, being so connected with the spirit world, she understood right away that the request had come not from little me but from spirit. 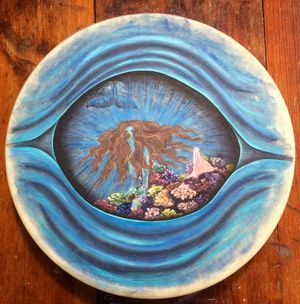 Two days later, Gayle called me on the phone to explain how she envisioned the various cosmic forces that wanted to combine to create this drum. I was wonder-struck at the way she described (without knowing me) a number of animal spirits that reflected so well my own experiences on the spiritual journey, and then proceeded to integrate them all into a beautiful, elegant, cosmic design, with colours that seemed to come out of my dreams! 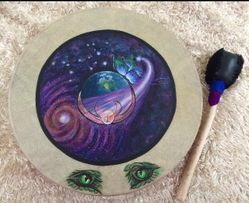 So now, you see, instead of just hoping that playing my drum will benefit humanity, I can do it with the knowledge that the Universal Peace drum really is powerful medicine for the world. How could it be otherwise when it already is so beneficial to me?! I would like to tell my story of how my beautiful drum came into my life. A few years ago a couple people I knew kept talking about this amazing women name Gayle Ann Crosmaz-Brown and how spiritual she was and that she made amazing drums. Well to be honest the drum thing didn't do a thing for me but I had to meet this women. One day I saw her Grandmother drum and it was like a light switch went on and I got the knowledge. I could feel it come from the drum through a picture on facebook which amazed me. I knew then I had to have one. I contacted Gayle and was amazed to know she lived only a few blocks away and she would meet with me. My first meeting I was so excited not only because of the drum but i was going to get to meet this amazing woman. When i got there we chatted for a bit then was treated to her playing her grandmother drum for me. As soon as she started to hum and play I closed my eyes. The music had me swaying and I felt like i was flying as she played I had a vision of a women with long white hair in a white gown walking through the desert barefoot in her hand was a staff made of snake skin, she motioned for me to follow her. Gayle stopped playing and I open my eyes as I told her what i had seen she walked into the next room and returned with a staff made of snake skin. I have to say I was quite blown away I had had 1 or two visions before that but they were like flashes and nothing like what I had seen. I sat with Gayle and she had some papers on the table face down and handed my the frame of my drum asking me to close my eyes and just rub the frame. As I did it was like some turned on a television set and I could see back to ancient Egypt, I saw a women in a group scoping water from the river into an odd shaped pitcher. I also saw a woman dressed with jewels adorning her head and neck. It was amazing all the things I saw. When I came out of it Gayle turned over the paper, on the paper was everything I had seen in my vision. These visions and images became the drum of my ancestors. 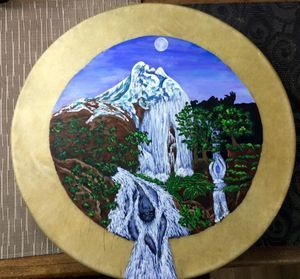 Since I have owned my drum I have had many visions and now I am very connected with my guides and Mother Earth. I love to sit outside with my feet in the dirt and play and see where my ancestors take me. I can't thank Gayle enough for bringing me to such enlightenment through the knowledge of my drum. I would like to sing the praises of Gayle Crosmaz-Brown, and extraordinary artist, drum maker and spiritual guide. When I attended my first drum circle with Gayle, I did not own my own drum. Gayle lent me one of her beautiful drums. It had a painting of a butterfly on it she saw in her own garden. 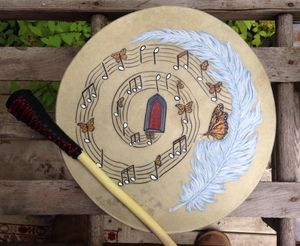 Transformation, connection to nature, connection to each other, both ancestors and those we love here on earth were experienced that day, with that drum. Rhythms created together in a circle manifested this incredible vibration you could feel in your very soul. I had to have my own drum! Gayle knew very little about me in terms of facts. She meditated and immersed herself in our spiritual energies as well of those of the ancestors. The result is the most beautiful piece of art, which symbolizes the facets of my being and aligns with everything that is meaningful to me. It is a mystery to me how this happened, but it had a most profound effect on me. The drum itself has a beautiful voice and vibration. The sound, alone and in combination with others, resounds within me and creates an amazing atmosphere for meditation. I ask questions of the universe as the vibration carries the thoughts outward. I always receive the answers. I feel a sense of peace when I drum. 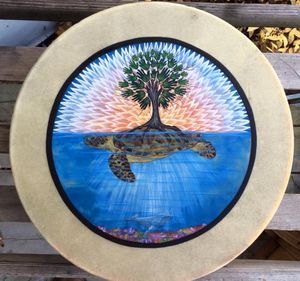 The drum created by Gayle also connects me to all the ancestors she has connected with and to all the people she has made drums for, all over the world. 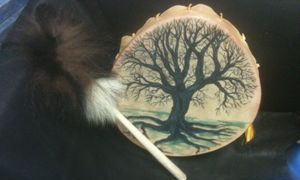 Gayle involves the person she is making the drum for, in all stages of the creation, showing the evolution of the drum. She also provides a description of all the drum’s features that are individual to the receiver. Gayle does a birthing ceremony to celebrate the giving and receiving of the drum and bless the union of drum, receiver and drum maker. It is an honour to have such a wondrous, spiritual creation that has been made just for me. There is no other like it and never will be. It truly is magical! It feels humbling that I could be a small part of your recent shamanic journey with Angaangaq Angakkorsuaq. Drum face is a painting of Angaangaq singing into the ice cave at Russell Glazier, Sacred Valley Greenland. Most of us enjoy music, and really get lost (or found) in a good beat. The buzz of the beats is like a familiar aroma taking you back, and forward, to.... anything. I'm sharing with you all that I'm really enjoying reaching out to my drum! Hello, nice to finally meet you, I am your new drum! and she has met many spiritual known figures...as well as being a special.....healing drummer her self........when you get a drum from Gayle......it is a part of you...with your story and your strength and one with the drums......She shares the healing drums with others....as Derrick and I do...when we go to the Alzheimer’s retirement home and have a very special contact...with our bunch....it gives them comfort & relaxes and lets them.......be in a place they are familiar and feel a part of something bigger then us.....Thanks Gayle for my drum.....Hugs Kiddo..
"I was deeply moved by the power and richness of Gayle's drum. 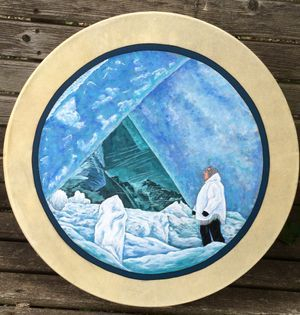 The drum offered me an opportunity to connect with myself in ways I had never before. It has become a vehicle that allows me to listen to my own inner wisdom and to connect to the heartbeat of my soul." 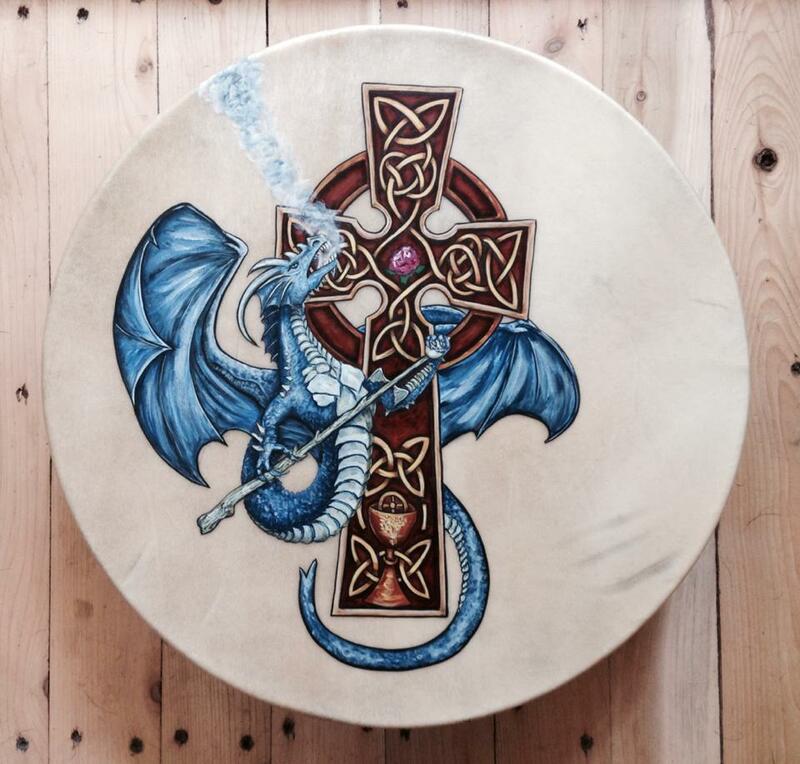 Gayle asked that I write a few thoughts about the drum that chose me and asked her to craft. The drum had it's mind and reason to come into my life. Gayle showed the depth of sensitivity to get herself out of the drums way and let it use her hands to take life. Gayle has taken on this role for people to allow them to marry themselves to the drum's intentions. I honour Gayle for her willingness to craft that into reality for me. Be Well Gayle; let the work continue in you. My Testimonial and Observations. 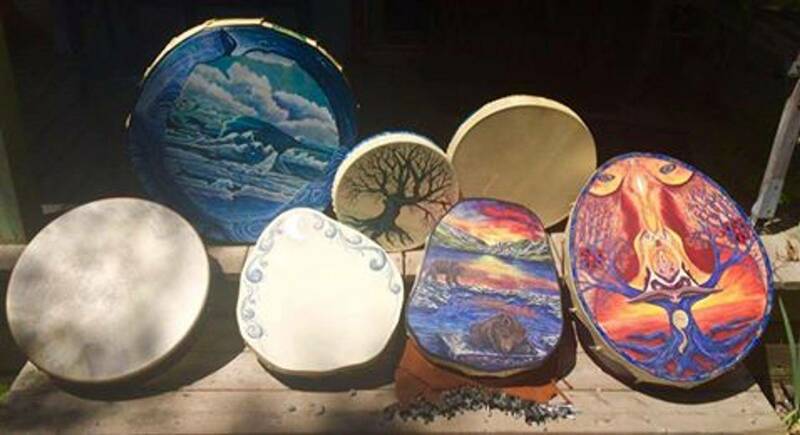 I had really never thought about owning a drum since I was already adept at finding my quiet space of meditation, however I felt compelled to speak to Gayle to find out more about her drums. I learned that Gayle doesn’t just grab the pieces and throw them together and paint a bunch of stuff on it. In fact nothing could be further from the truth. She actually waits for instructions to come to her as to how to proceed with the project based on the intended result. 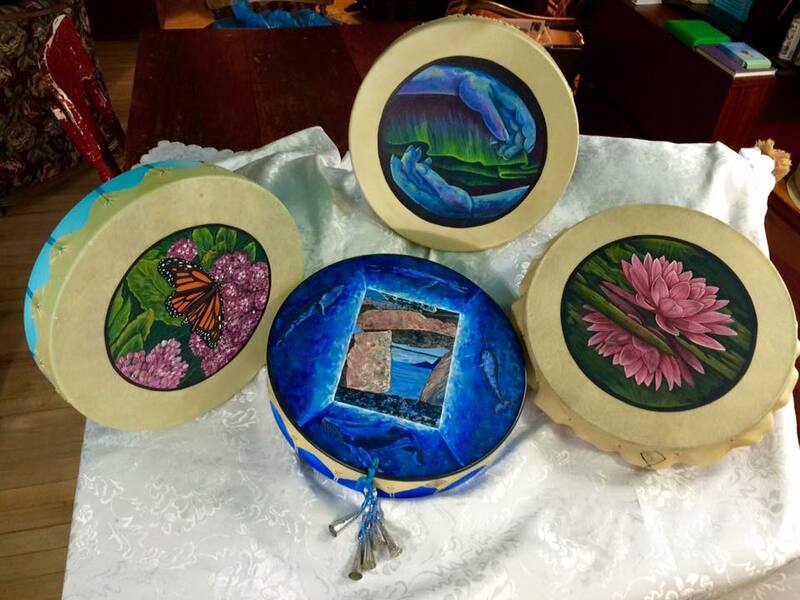 She awaits instruction from her ancestors and elders to find the exact symbols to incorporate, and after the Drum Birthing Ceremony the drum is ready to participate with the drummer as a tool for healing, clearing, meditation, inspiration… whatever is needed at the time. I use my drum regularly and enjoy tremendous results on every level. I love it! 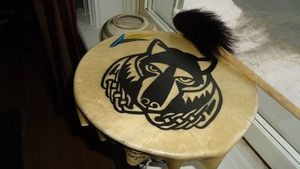 When I decided I wanted to get a drum it was a message I received from great spirit. I knew that I had to use Gayle. Although we had never met I knew she was the right person. We met online through a mentor and friend of ours Uhane Harry Uhane Jim a great Hawaiian teacher. Although we had never met before her drum truly represented me and my journey. I gave her freedom to design whatever came up through her meditation and prayer and it is perfect. 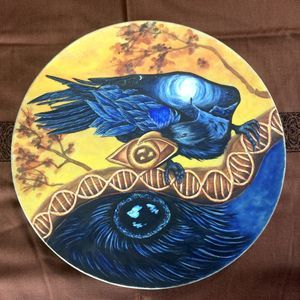 The drum is my story, from the crow medicine that it carries, to the sea horses and the DNA strand which the crow stands on to help heal ancestral trauma it is a message from a higher plane. I could not be happier with the blessings that this drum has provided for me and my clients. Gayle is truly gifted at what she does. When Spirit calls, I answer. And when a drum was meant to be created for me, Spirit brought Gayle into my awareness. After all, nothing is random. The most important thing to me in the creation of this drum was the love, ceremonial intent and sacredness that Gayle supplied. She tuned in and co-created so beautifully with Spirit and birthed this magical musical love maker into being. Words cannot express the depth of heart I feel when playing her. Whether it is for use in my Journeying for myself or when I'm tuning in and tracking or journeying for my clients, she is just pure Magic. Here are some photos that someone took on my retreat in April with don Oscar Miro Quesada at our sacred full moon fire. My testimony for Gayle’s Drum is a little different from others. I attended a Water Blessing Ceremony with Gayle about 4 years ago and was checking out the items at the silent auction table. I wasn’t working at the time, so didn’t plan on purchasing anything. However, there was a drum that kept calling my name, hmmmm. 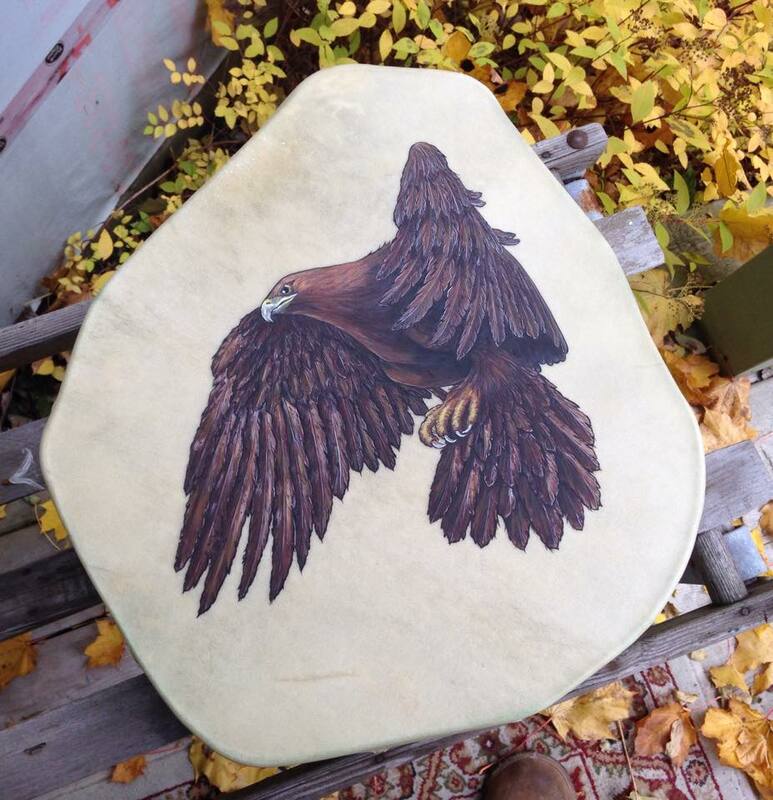 I had no idea who made this drum, it was a beautifully hand crafted drum with a vibrantly painted rising phoenix. I was in the midst of a life transformational stage, and just felt the urge to place a bid down on the paper. I remember thinking, OMG, if only I remain the sole signature. The universe was listening, and when my name was called for the drum I felt elated. Then Gayle says, “You got my drum”. What??? Bonus! 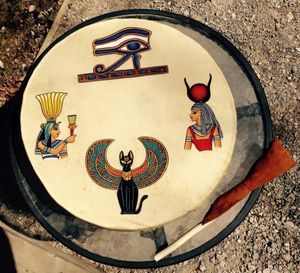 My drum comes with me to all group gatherings, and has become a close friend guiding me to higher frequencies. The energetic imprint that Gayle infuses with each of her creations, has merged with my being on the highest levels. YES!